Home » Leary or Leery – What’s the Correct Spelling? When you walk down a dark alley at night and a strange man offers to sell you some wristwatches, you have every right to be suspicious of him. The watches are probably counterfeit or stolen, and you should leave at once. When you are suspicious, uneasy, mistrustful, or wary of someone or something, you might also be leery. Or is it leary? Both spellings would be pronounced identically, which makes it difficult to remember which is correct. Never fear, though, because this post is dedicated to explaining the differences between these two words, so that you will always know which to use. What is the Difference Between Leary and Leery? 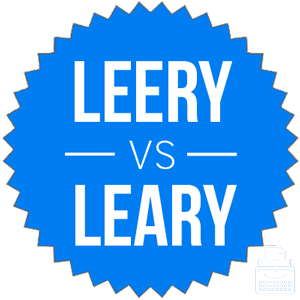 In this post, I will compare leary vs. leery. I will outline the correct spelling and use it in several example sentences to demonstrate its proper context. Plus, I will show you a helpful memory tool that you can use to decide whether leary or leery is correct. What does leery mean? Leery is an adjective that means suspicious or uneasy. Little Red Riding Hood was wise to be leery of the Big Bad Wolf, for example, just as you should be leery of raw chicken that has turned gray. Leery was first recorded in English in 1718. It is probably related to the verb leer, which has the meaning to give a sideways glance. If you are suspicious of someone, you might watch them out of the corner of your eye, or leer at them. Here are some examples of leery in a sentence. Jessica was leery of working alone in the warehouse with Mark, because she did not trust him to maintain a respectful personal distance. The opposing team was leery of the water bottles offered them by the home team, as they might be laced with sedatives. What does leary mean? Leary is a nonstandard variant of leery. Most dictionaries, including the Oxford English Dictionary and the American Heritage Dictionary, don’t even list this spelling. The few dictionaries that do list it list it only as a secondary spelling behind leery. The reason for this, of course, is that leery has been the standard, accepted spelling for over 100 years in both American and British English. As you can see, leery predominates by a huge margin. Bryan Garner estimates the difference in usage between leery and leary to be 32:1. In other words, leary is more than nonstandard variant at this point. It’s a simple spelling error. There’s only one correct spelling of this word in the 21st century. If you are using the word as an adjective that means suspicious or wary, use leery. Since leery is related to the verb leer, it should be easy to remember how to spell this word. Is it leery or leary? Leery is an adjective that means wary or suspicious. Leary is a variant spelling that hasn’t been widely used in 100 years. Leery is the correct spelling. Leary is a spelling error. 1 What is the Difference Between Leary and Leery?